Ace Premium Drag Racing Clutches are designed utilizing a one-piece billet cover with a unique profile. This design provides superior structural integrity (i.e. stiffness), and a lower polar moment of inertia. 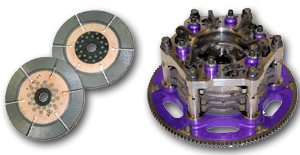 We offer a complete line of clutches, discs, floaters, and clutch accessories for drag racing professionals. Assemblies are available in 6.25″, 7″, 7-1/2″, 8″, and 9-1/2″. If you are ready to join the long list of winners who have found that our products and services have given them a competitive edge, call today to speak to a racing expert.